History buffs who go to the movie, “Lincoln“, are a bit surprised to see Schuyler Colfax, the Speaker of the House of Representatives depicted as a doddering, white-haired old man. Colfax (portrayed in the movie by Bill Raymond) was actually a handsome, charismatic man – and one of the youngest House Speakers ever. He was a man who might have become President himself, if not for a strange scandal. Colfax, a congressman from South Bend, Indiana, was only 39 when he was elected to the House’s top leadership post, after the 1862 elections. He had been just 29 went first elected as a U.S. Representative in 1852 (he had run in 1850, and narrowly missed election that year). A native New Yorker, he had always been a vocal opponent of slavery. Though an ally of President Lincoln, the men weren’t close. But Lincoln did – on the day he was later assassinated – assign Colfax to a fateful mission. Lincoln asked Colfax to travel to California and convey to miners the value to the U.S. Treasury of their precious metals prospecting. The roads were so bad getting there, Colfax made an impassioned and enthusiastically received public speech for the building of a railroad, to avoid the roads. As a result, Colfax, perhaps more than any other elected official, wound up being the impetus for building the first transcontinental railroad. A railroad terminus and town in California were named for him, and a statue erected in his honor. The railroad was completed in 1869. In 1868, when Civil War hero General Ulysses S. Grant ran for President, he selected Colfax as his running mate. They easily won election, and at ages 46 and 45, respectively, they were the youngest men ever elected to the nation’s top offices (until Bill Clinton and Al Gore in 1992). Only one other elected official in U.S. history, John Nance Garner, served as both House Speaker and Vice President. Finished as a politician, he made his living giving lectures after that, and lived until January 1885. The railroad, so much of a part of his life, played a part in his death. He was forced to walk between two depots in Mankato, Minnesota, to change trains in minus-30 degree weather; it was only a five-minute walk, but the extreme conditions exhausted him and triggered a heart attack. 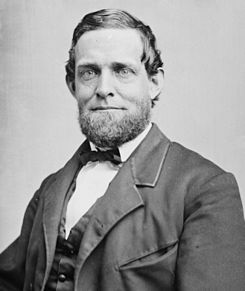 Schuyler Colfax, just 61, keeled over and died.